On Sunday I had a quick business meeting over in Vancouver. Saturday night I slept in the truck once again, still on piglet watch with Olivia. Sunday morning down on the farm started a bit earlier than usual because of my ferry departure, but was otherwise completely normal. No piglets. No nesting. Full teats, but she’s had those for a while now. So off I went thinking I was in for another night in the truck after I returned. I took the 9am ferry over to the mainland and was just about to drive off the boat when a text came in from LS, who is visiting from Berlin and holding the fort while I was away. Olivia, according to LS, was behaving strangely. He sent a couple of photos of her pen. She had been busy in the couple of hours since I left the farm. She had stripped leaves from the bushes in her run and scattered them around in her bed inside the safety pen. She dragged in mouthfuls of sticks and twigs and added them. 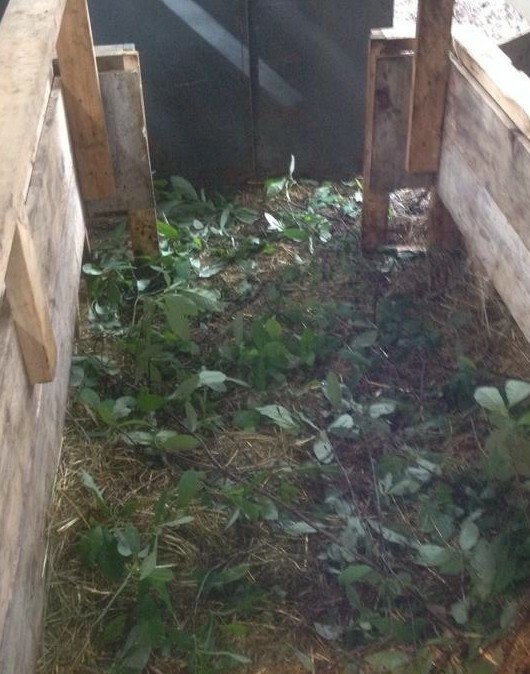 She rooted around and fluffed up the hay from underneath the fresh debris and mixed it all together. Olivia was nesting!! I made it back to the terminal in time to catch the 1pm boat, flew into the house at 3:10, pulled off my meeting clothes, pulled on my grubbies and rubber boots and raced down the hill. The guys had done a fabulous job of setting everything up – the heat lamp was positioned over two nursery boxes (used to contain the piglets as they awaited the arrival of their siblings), fresh towels were at the ready, Olivia was in her safety pen, the wet leaves and sticks had been removed and replaced with clean, dry hay (which she had been reorganizing all day). The first piglet arrived at 4:01. Olivia lost her mind, leaped to her feet, spun around, and tried to kill it. This pattern was repeated every 15 minutes or so for the next couple of hours, but because of the new safety pen, each piglet was plucked out of the pen before Olivia could do any damage to either the piglets of to any of us [thanks to earlier helpers MC and SP, who built the pen after long discussions about crazy sows. Now that we know it works, I’ll post a how-to article soon with more details of what we came up with as a solution to porcine matricide.] By 6:30 pm we had 11 healthy piglets – 6m and 5f. We were feeling pretty smug at this point and settled in to await the expulsion of the placenta, knowing from experience that she would have no interest in nursing the piglets until that was done. It took some time and some massaging of her teats to stimulate contractions, but in due course it arrived just fine. By now it was after 9pm and we began the process of trying to introduce the piglets for nursing. At which point we were thwarted by Olivia’s ridiculous (and terrifying) insistence on pouncing on any piglet that wandered anywhere near her. She ate a meal, we let her outside to stretch her legs and relieve herself – she paced and turned and nested and lay down and got up and steadfastly refused to have anything to do with nursing. Her attacks were slightly less vicious, though – she was tossing piglets aside but not savaging them any more – only two had superficial bite wounds and those were from earlier in the evening. This entry was posted in Blog, DIY and Projects, Pigs, Uncategorized and tagged #atozchallenge, a to z challenge, Dark Creek Farm, delivering piglets, farm life, farrowing, farrowing pen, hogs, homestead, Large black hogs. Bookmark the permalink. Are you starting to wonder if your going away from the farm causes the animals to go into labour? I also can’t wait for the conclusion to your story! I love farm life posts! I’m a farmer’s daughter and I remember baby pigs -soooo cute!